Jeff Dillon will play the trombone at Abravanel Hall on Saturday with the All-State Band. More than 50 trombonists auditioned for the band, but only 12 were selected. Dillon wanted to learn to play the trombone after the Tooele High School band visited his elementary school. It was the first time he had seen a trombone and was “fascinated” with the slide. Dillon wakes up early to practice with the Tooele High School Band. Practices start at 6 a.m.
Jeff Dillon of Tooele would like you to know that angels play the trombone. After playing the trombone for about eight years, Dillon, age 17, knows all sorts of interesting facts about the instrument. 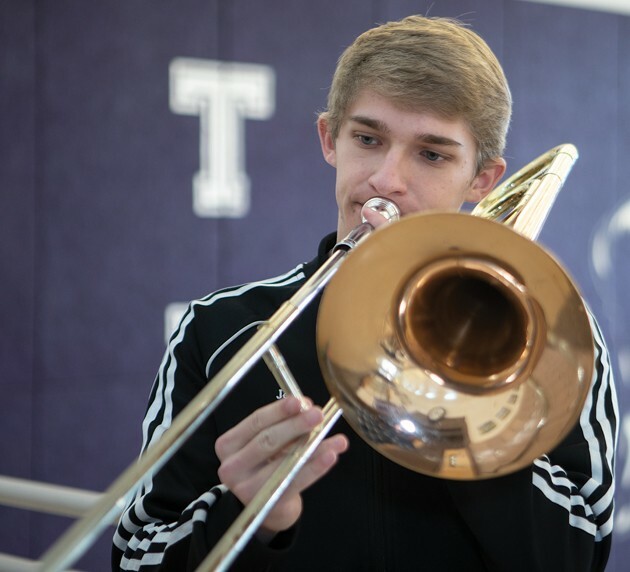 His passion for the trombone started in fifth grade, when the Tooele High School band visited his elementary — and when he saw a trombone for the first time. 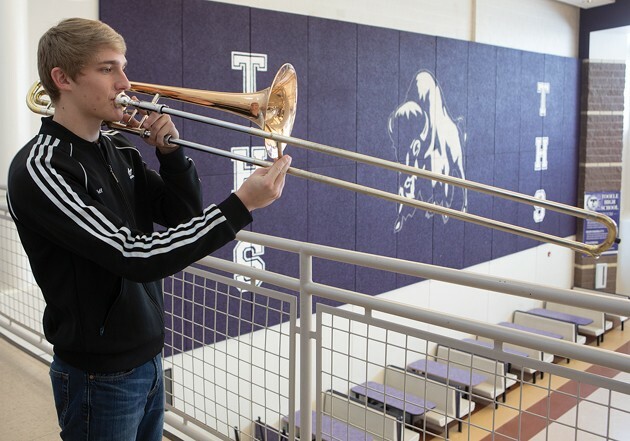 Now a senior at Tooele High School, Dillon has been playing the trombone for almost half of his life. 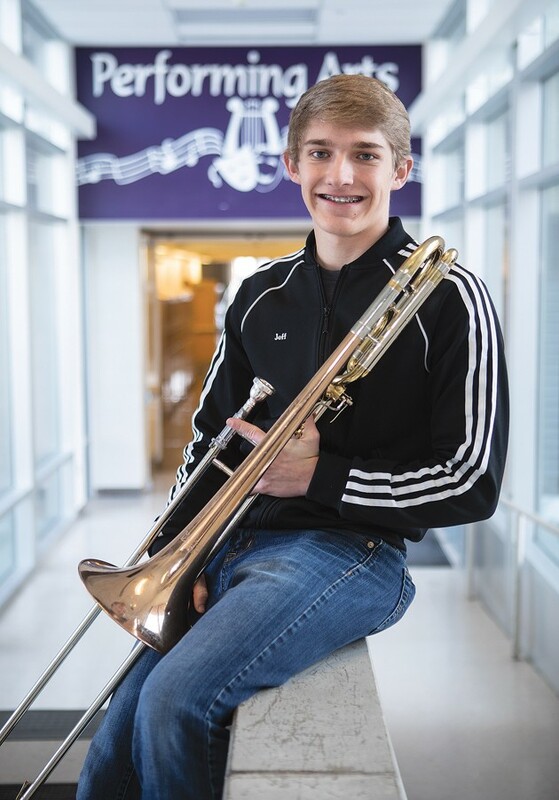 After playing in elementary and junior high school bands, he’s a part of all three of Tooele High’s bands — jazz band, concert band and marching band. They’re also called the Buffalo Brigade. Starting as a freshman, Dillon practiced a lot to get where he is now. 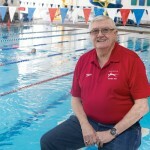 Some of the more experienced seniors were ahead of him. After years of hard work, he is now first trombone in jazz and concert band, and a section leader in marching band, as well as the band council vice president. “I’ve been playing the top parts for most of my high school time,” he said. According to THS band director Orien Landis, Dillon has played a part in the concert band’s success. The other bands have succeeded as well. This year, the Buffalo Brigade took third at state after a string of fourth-place finishes in past years. Although jazz band has never made it to the state festival, its musicians hope to make it this year with Dillon as the top trombonist. 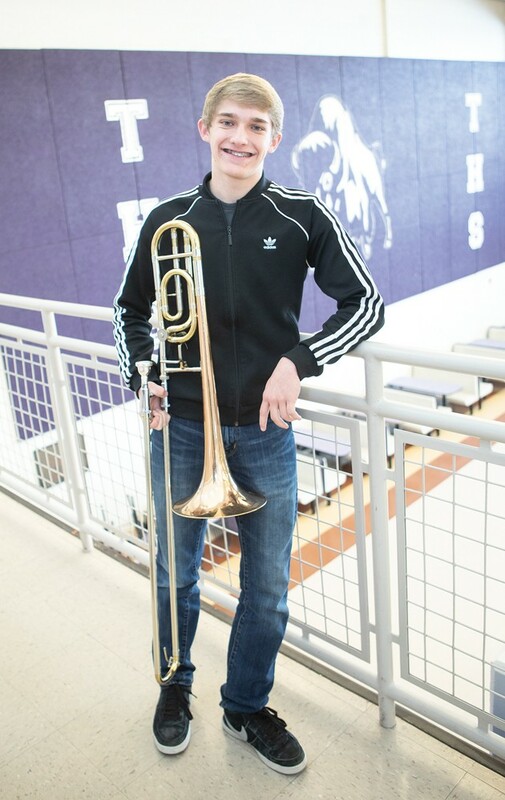 Dillon has had success in more than just the ensemble bands; he received a superior rating in a trombone duet with his friend, Jacob Mull, at state last year. And this year, he was the first Tooele High student in over five years to make it into All-State Band. 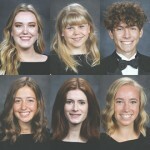 All-State Band is a collaboration of over 100 of the best high school band musicians in the state, who come together to play a concert at Abravanel Hall in Salt Lake City. 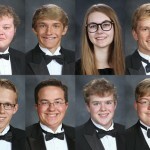 More than 50 trombonists in the state auditioned for the All-State Band, but only 12 were selected to perform. The performance will be on Jan. 19 at Abravanel Hall at 7 p.m. Dillon said he’s excited to play with other students at the venue. Each musician learned the same song for their audition video, which was submitted and judged. 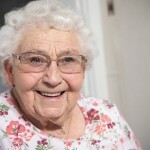 The music was released to musicians around August or September, and Dillon said he recorded about 15 different takes of his video before taking one good enough to send in. Although he normally tries to practice five hours a week, Dillon said he practiced two or three hours every day in the weeks leading up to the audition cutoff to perfect the song. Although he said he sometimes wants to sleep in rather than go to practice, Dillon doesn’t really mind the hours. Landis greatly appreciates Dillon’s dedication. Since Dillon recently began taking private trombone lessons with Bryan Keegan, he said he’s found an even deeper love for the instrument. “… My sophomore year I got burnt out a little bit,” he said. “… Junior year came by, and I started taking private lessons and fell in love with playing a lot more than I had previously. Dillon said his teacher pushes him to constantly improve. Dillon is currently working on learning Concertino by Ferdinand David. Besides finding inspiration from his mentors, he’s also found inspiration and motivation from his family. His mother grew up playing upright bass and percussion, and taught him and his younger siblings to play the piano. All four of his siblings play instruments. This year, his brother Dorian made it into the junior high All-State Orchestra playing upright bass. Dillon is busy with more than just the bands; he’s also been preparing for life after high school. He’s submitted applications to colleges and plans to play in college band after high school, hopefully at an Ivy League university. He’s been keeping his grades up in order to make it into such prestigious schools. He’s also on the ballroom dance team, and was awarded Sterling Scholar in dance this year. He participates in mock trial, which is similar to debate, and also plays competitively “Magic: The Gathering,” a fantasy themed card game. He’s been on sponsored tours to Florida and Spain for the card game’s elite competitions. “I think Magic is probably my favorite thing that I do,” Dillon said. With motivation and support from his family and teachers, Dillon has achieved greatness in his passion. But most of all, Dillon loves the experiences he’s had in band that have led him to All-State Band.